I love the versatility of quesadillas. I love the different filling options and the different cooking options. If you’re in the mood for a smokey quesadilla, you can make one on the grill. If you prefer to use a skillet or griddle to get that perfectly browned and crispy tortilla, then go with that option. Or you could always just put one into a sandwich/panini/quesadilla maker too! 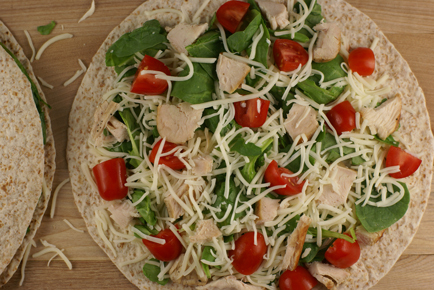 What is your favorite filling for a quesadilla…besides the cheese, of course!!?!! My friend Kristin introduced me to pizza quesadillas! Put pizza cheese and what ever toppings you’d like and dip in pizza sauce 🙂 Yummy, quick and easy! I love fresh cilantro and chicken with my obligatory cheese – my brother has been making himself “tortilla pizzas” since he was 6 years old and could reach the microwave! I think it is probably still his favorite dish now that he is in college. Hi Erin, I love cooking my quesadillas In a Skillet or on the Griddle I love them with chicken or beef. Last night, I made quesadillas with mashed up sweet potato, green onion, cilantro and cheese. They were delish! My four year old asked me to put cut up ham from Easter in hers, and she said it was great! I like to add grilled peppers and onions to mine! I love this post! I have been on such a quesadilla kick recently. I always cook them in a skillet and I put ANYTHING that I might have on hand. My favorite, though, is probably goat cheese and black beans served with fresh guacamole. ( http://cookingwitherin.blogspot.com/2010/02/black-bean-and-goat-cheese-quesadillas.html ) Last night, however, we went with the straightforward ham & cheese. Yum! I love the versatility of quesadillas too! Here’s an exotic take on it: swap tortillas for naan and use your imagination to make an Indian quesadilla. I use onion, coriander, masala, paprika, tumeric, tomato paste, chicken, and yogurt! My husband and I love making buffalo chicken quesadillas. Chicken, Monterey Jack cheese, sautéed onions, red peppers, a drizzle of ranch or bleu cheese, and LOTS of Franks red hot buffalo sauce!